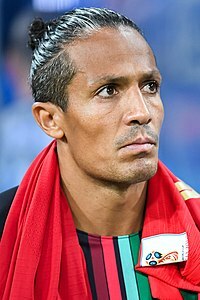 Bruno Eduardo Regufe Alves (Portuguese pronunciation: [ˈbɾunu ˈaɫvɨʃ]; born 27 November 1981) is a Portuguese perfaisional fitbawer that plays as a centre back for Italian club Parma Calcio 1913 an the Portugal naitional team. ↑ "FIFA Confederations Cup Russia 2017: List of players: Portugal" (PDF). FIFA. 20 March 2018. p. 7. Retrieved 28 March 2018. ↑ "2018 FIFA World Cup Russia – List of Players" (PDF). FIFA. 10 June 2018. p. 23. Retrieved 10 June 2018. This page wis last eeditit on 15 Julie 2018, at 04:58.